Through the words in Luvina Bozeman's journal, we follow the lives of the Bozeman Family as they struggle to make a living in the rugged hills of the Ozarks. Luvina (Lenny) and her sister were always close but their bond strengthened after the death of their mother. When Lenny ran off with Josiah Bozeman, her family was heartbroken. Lenny wrote to her father but the letter was returned, leaving her to believe that her family was dead. Lenny goes on with her life, although saddened by her loss. Thirty three years later, Lucy receives a mysterious package, a green hat box. When she opens it, the strong smell of sage is overwhelming. Inside the box she discovers her mother's old apron and her sister's journal. Through the journal she relives her sister's life, the hard times and the good times, through war, and the birth and death of Lenny's daughter. She finds the missing pieces of her own life. 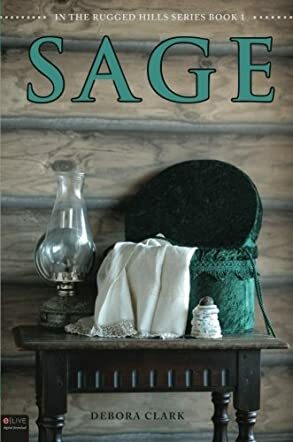 "Sage" is a unique historical novel. It stands out in the crowd of novels. The plot and characters touched my life. There is a strong Christian influence in this magnificent book. I have been to the Ozarks several times. I could easily imagine the courage and strength the Bozeman's had to survive there. They had faith that the Lord would keep them safe and watch over them. This is book one of Debora Clark's "In The Rugged Hills" series. A must read!! Couldn't put it down. Loved the story and growing up in the hills. Can't wait to read the next one. I am anxious for the next book in the series. I loved this book.